Malta narrowly avoided being labelled as a tax haven during a stalemate vote at the European Parliament this afternoon. A total of 327 MEPs voted in favour of an amendment to the Panama Papers inquiry report, proposed by the socialists, while 327 voted against. 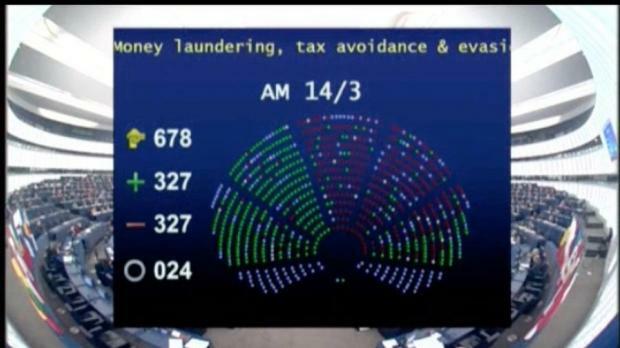 All Maltese MEPs voted against the amendment, which called for the European Commission to regard Malta, Luxembourg, Ireland and the Netherlands as tax havens. Socialist MEP Jeppe Kofod, a co-rapporteur of the Panama Papers report, said yesterday that the proposed amendment had caused a “split” within many of the political groupings. Sources said Pana chairman Werner Langen, from the EPP, argued in favour of the amendment, but the EPP as a whole shied away from the socialist’s “naming and shaming” policy. Malta has come under increasing pressure to reform its tax regime over the past few years. On paper, the country offer a 35 per cent tax rate for foreign-owned companies. This is then reduced to an effective rate of five per cent once the companies apply for a 6/7ths tax refund from the government. Critics of the system question both the fairness of eating away at other countries' tax bases, as well as its role in attracting dirty money flows to Malta. Prime Minister Joseph Muscat has insisted that the system is fully compliant with EU rules. In a statement, the Nationalist MEPs observed that practically all Socialist MEPs voted to declare Malta a tax haven. "The consequences of a vote in favour of this amendment would have had severe implications for Malta financial services industry," they stressed. MEPs David Casa, Roberta Metsola and Francis Zammit Dimech said they had a crucial role in convincing their EPP colleagues as well as MEPs from other political groups, that the people of Malta, who work hard and do things by the rules, should not bear the brunt because 'of the illicit activities of Minister Konrad Mizzi and Keith Schembri'. Mr Casa said it was disgraceful that Labour MEPs allowed their political group to table this amendment. "It shows that when push comes to shove they are capable of a lot of talk and very little else. There were elements within our own group that wanted to support the Socialist amendment. Let me be clear: It is because of the phenomenal work of the Partit Nazzjonalista delegation that this amendment did not pass," he said. MEP Roberta Metsola said Malta was under the spotlight again because of the Prime Minister’s continued failure to take any action on Konrad Mizzi and Keith Schembri while allowing them to continue to operate with impunity at the heart of government. Dr Zammit Dimech said the EPP Group reasserted its commitment to stand with the Maltese people. The European Parliament approved the Resolution on the inquiry into money laundering, tax avoidance and tax evasion. The Resolution - which has been prepared by the Committee of Inquiry (PANA) to investigate alleged contraventions and maladministration in the application of Union law in relation to money laundering, tax avoidance and tax evasion - includes recommendations which will now be sent to the European Council and the European Commission. In a statement, the Labour Party said its MEPs were once again strong and crucial in their work aimed at putting the interests of Malta before any other consideration. Their vote against an amendment that proposed Malta as a tax haven and their work to explain why Malta was not such were crucial for the amendment not to pass. In fact, the votes against the Socialist Group’s amendment by members within the same group made a huge difference. The PL said the same could not be said for Nationalist Party MEPs who, with their attitude and campaign against Malta in the past years had opened the door wide for such attacks against the country. Mr Langen’s speech clearly showed that the PN was to blame for this attack against Malta and it was now too late for them to say they worked in favour of the country. One hoped that the PN MEPs would one day understand that politicians from other EU states would not think twice to undermine Malta’s competitiveness and it would be helpful for them to have Maltese MEPs working against their country. This was what the PL’s MEPs had always warned about. The Labour Party welcomed the fact that the amendment that wanted to place Malta as a tax haven did not pass. This was so because Malta was not a tax haven and its taxation system was in conformity to European Commission and OECD regulations, among others.